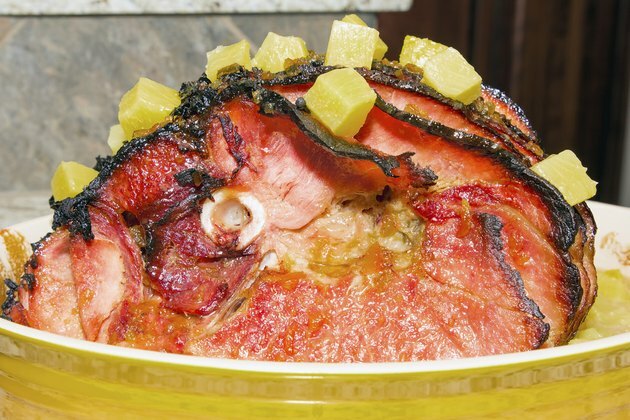 A whole ham is a savory, elegant meal for a holiday or a Sunday dinner with the family. Ham is the cut of pork that comes from the upper hind leg of the pig, and you can purchase hams either fully or partially cooked. Select a ham that includes a glaze packet or choose one that has been smoked over a hardwood such as mesquite. Supermarkets and butchers usually sell hams that are between 12 and 14 pounds Sometimes, however, you just want a smaller ham portion to serve a small group or to limit the leftovers. Take the ham out of the refrigerator and allow it to warm to room temperature before cooking. Cold ham will melt off most of its fat before it has a chance to warm up and begin cooking, which can make the ham dry. Place the ham in the Dutch oven and cover it with 2 cups of ham stock, water or dry white wine. The ham only needs a small amount of fluid to keep it moist as it braises in the oven. Cook a smoked, partially cooked ham covered for two to two-and-a-half hours, or until a meat thermometer inserted into the ham registers 160 degrees Fahrenheit. If the ham is fully cooked, cook it for one hour. Fully cooked hams do not need to be cooked, but cooking warms it and enhances its flavor. Take the Dutch oven out of the oven and transfer the ham to a serving platter. Allow the ham to rest for 10 minutes before you slice it off the bone or separate the slices, if the ham is presliced. Is a Ham Bad to Eat While Bodybuilding?